A man who was visited at his home by a Social Security Fraud Inspector had a rather unusual physical characteristic. William Waghorn, about 75, of Fountain Road in Hull, received the visitor and his 'associate' when there was a rap on his front door sometime back in 1988. The Inspector explained why they had come, and the occupant asked them in. As the visitors followed Waghorn, they became aware that his carpet seemed to be 'rather odd', and that their shoes were tending to 'stick' to it as they walked. There was also a 'scratching sound'. When the three men reached the living room, they remained standing; there was nowhere to sit. Something that had once been a sofa, but had long since stopped being one, was in front of what had once passed for a fireplace. The ex-sofa had no cushions, the vinyl had been ripped off, the foam had been 'gouged out' in several places, and it looked like it had been dead for a long time. Someone - presumably Wayne Jennings - had used spray paint to decorate the wall with 'WAYNE JENNINGS WOZ ERE'. Presently, the visitors noticed Mr Waghorn wasn't wearing shoes. Their eyes were drawn to his toenails, which had not seen a nailclipper for some considerable time. They extended beyond the end of his toes and curled over towards the carpet. Any one of them would have prevented shoes from being worn. Now they understood the scratching sound. 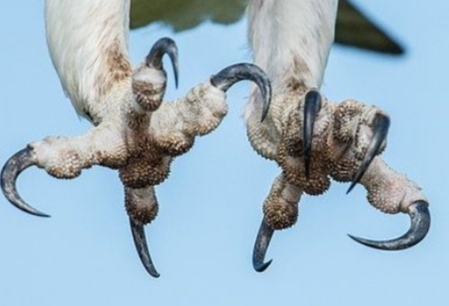 The toenails were, in effect, talons. The inspector quickly concluded his business, and then motioned to his associate that they should leave. The scratching sound followed them out of the room and down the passageway to the front door. There was no other sound. Just the scratching. Mr Waghorn thanked them in his jittery voice, but neither of the visitors said a word, or turned round. They got back in the Inspector's car looking pale. The Inspector turned the key in the ignition, and the car moved away. The driver drove to the end of the road, then turned right at some traffic lights, then into a supermarket car park. He slowed to a halt in a remote corner, and turned the engine off. The only thing that could be heard was the sound of the two men breathing as they tried to remove the image of the man's talons from their minds.